Romania: 99 per cent of farms are family farms. The remaining 1 per cent owns more than half of agricultural land and receives 70 per cent of subsidies. ‘Give me one million euro and in two months it’s gone. Collecting land is an addiction only farmers can understand.’ The adrenaline is pumping through his veins. Frank Depotter, a West Flemish potato farmer, has just bought 28 hectares for 140.000 euro. Last year he bought 600.000 euro worth in land. Through the window of the small meeting room above the processing department, the sunset is shining its red glow over the vast fields. Depotter pulls out a map that shows all the parcels in the vicinity of Sag, a small village of 2600 inhabitants. Ill-considered land reform after the revolution of 1989 created a polarized landscape: disproportionately big industrial holdings – former state-owned farms privatized by social democrats – and many small, unregistered parcels of two hectares at most – the land of the cooperatives given back to their original owners. But most of these original owners had been working in the city for years and no longer felt a connection to the land, let alone did they have the machinery to work it. The new government never performed a land survey to include these lands in the cadastre. Moreover, they were too small to qualify for farm subsidies. FirstFarms is an investment company at the Copenhagen stock market. The managing director is Anders Nørgaard, a former banker from Jutland. In 2006, 2600 shareholders gathered 63 million euro for investments in Slovakia, Romania and Hungary. The biggest shareholders are other Danish investment companies. The Romanian farmer Constantin Ureche ended up in a conflict with the Danish investment company FirstFarms. Constantin Ureche, a Romanian farmer with 28 hectares next to the land of FirstFarms, is standing in front of the orthodox church of Ghilad, a village of 1800 inhabitants, in his Sunday best. He just attended a memorial service for his deceased ancestors. His daughter offers us blessed corn cake, which they make for these occasions for family and friends. Ureche’s neighbour gave one hectare to FirstFarms in exchange for three hectares closer to his house. ‘Both parties benefit from that,’ says Zoltan Bogre of FirstFarms. ‘Sometimes we buy land, not to work it, but to use it in land consolidation negotiations. These three hectares served us less strategically than that one hectare that expands our consolidated land. Constantin Ureche has had a different experience with FirstFarms. The Danish company invested in the first cleaning of irrigation canals in twenty years. ‘Without asking for my permission, they dumped the dirt on my land’, he says, while showing us the stretch of land. FirstFarms refutes that ‘this is high quality land that Ureche can spread out over his land’. But Ureche does not have the machinery to do that. As a result, for the past two years he is losing the harvest of one hectare of land. Ureche’s house is a shabby country cottage that reminds of films about the Flemish countryside of the 19th century. The confetti of his granddaughter’s birthday party is still lying on the floor. His wife is tucking the child into a double bed. On the wall is hanging a tapestry of Jesus. Next to the house stands Ureche’s only machine: a 1993 tractor. ‘One of the fourteen brand new super tractors of FirstFarms is worth more than my whole farm’, Ureche laughs cynically. The next little town we visit at dusk almost seems haunted, until we enter the local grocery store/café. Drunken men are yelling and screaming, beer and palinka are flowing. Two farmers are building a wooden shed for the sheep. Behind them, nothing but stretched meadows until the horizon. The Austrian is Helmuth Kulterer. According to the numbers of the government agency that manages the European farm subsidies in Romania, his company Ineu is the twenty-second biggest landowner. They have nearly 7000 hectares in de vicinity of Ortisoara. In 2016 they received more than a million euro in European farm subsidies. In the village café of Ortisoara old men with red noses are slurping their beers. -‘Didn’t you sell to the Austrian?’, a man yells. -‘Yes, and to the Belgian’, Titel Stanic says. Stanic is renting out 27 hectares to “the Belgian” and has sold 33 to Ineu. The Belgian appears to be the West Flemish farmer Rik Brusselle, who founded the company Bruholand in 2014. Stanic takes us to see the land he sold to Ineu. On the land now stands a storage facility. But it turns out it is no longer the property of Ineu. The Austrian RWA Raiffeisen Agro Romania bought it in 2016 from Ineu. In 2014 Ineu had bought land around Ortisoara with a value of 4 million euro. In 2016 the value of their land stock had decreased to 870.000 euro. ‘This means they bought the land just to sell it, when land prices increased,’ says Attila Szocs, director of the farmer organisation Eco Ruralis. To oppose fragmentation, the Romanian government supports small landowners to sell their lands, but they do not protect local buyers from more wealthy foreign investors. A poor population does not have the means to resist a takeover by the agro-industry. Titel Sanic does not regret selling his land. His pension is barely 190 euro a month. Gianvito Pantalea of RWA Raiffeissen Agro Romania says, on his own behalf, that he regrets the disproportionate scale of the agro-industry in Romania, but that land concentration is ‘our weapon to compete with Chinese agricultural giants who otherwise monopolise all of Europe’. At the foot of the silos of Carani, the biggest on Southeast Europe, is Carani, a village of 1700 inhabitants. Giants are also coming from tiny Lebanon. Two trucks of the Maria Group are parked in front of a grocery store in Ortisoara. The drivers are drinking coffee in the sun. ‘Those Arabs have so much land, but they are still paying us the minimum wage’, they say angrily. Grain giant Maria Group is part of the empire of Jihad El Khalil, the third richest farmer in Romania. El Khalil owns a farm of 20.000 hectares. That is an equivalent of 30.000 football fields. An average European farm has 15 hectares. Thanks to connections with the social democratic party, Lebanese with Romanian nationality were able to rent one of the biggest former communist farms from the government in 1991. Nowadays the farm produces 300.000 tons of grain annually. All of El Khalil’s companies together generate an annual profit of roughly 7 million euro. At the foot of the mills, the biggest in South Eastern Europe, lies Carani, a village of 1700 inhabitants. Marian Prodea is working on his farm. At a table full of fresh cheese and pickled vegetables he shares what he knows of the complex story of tax evasion and opaque structures of sister companies. In 2006 the German investment company Aton Group pumped 200 million euro in the foundation of a Romanian subsidiary: Aton Transilvania. They bought the old mills of Carani for 12 million euro – German capital and European funds from the Special Accession Programme for Agriculture and Rural Development when Romania was still a candidate country. With 40.000 hectares they managed a gigantic agricultural empire. But then the Romanian Directorate for Investigating Organized Crime and Terrorism (DIICOT) accused Romanian managing director Nikolaus Mann of bribing judges, fraud with European funds and embezzlement of 33 million euro of Aton Group. Mann was sentenced to fifteen years in prison. Aton Transilvania went bankrupt, and the mills of Cariani were shut down for four years. The silos of Carani, managed by the Lebanese Maria Group. They are being prosecuted for tax evasion worth 30 million euro and received more than 7 million euro of farm subsidies from the EU. SIFI TM Agro, an affiliate company of the second biggest investment company at the stock market of Bucharest, bought the mills in 2015. A Cypriotic company and a Lebanese company that has Sarkis Elias Sarkis on its management board, also one of the owners of Maria Group, are owning the company. Also, Maria Group bought 3000 hectares from Aton Transilvania for 10.000 euro. The Lebanese already have the strategic region near the Black Sea, where they even control a part of the port of Costanta. 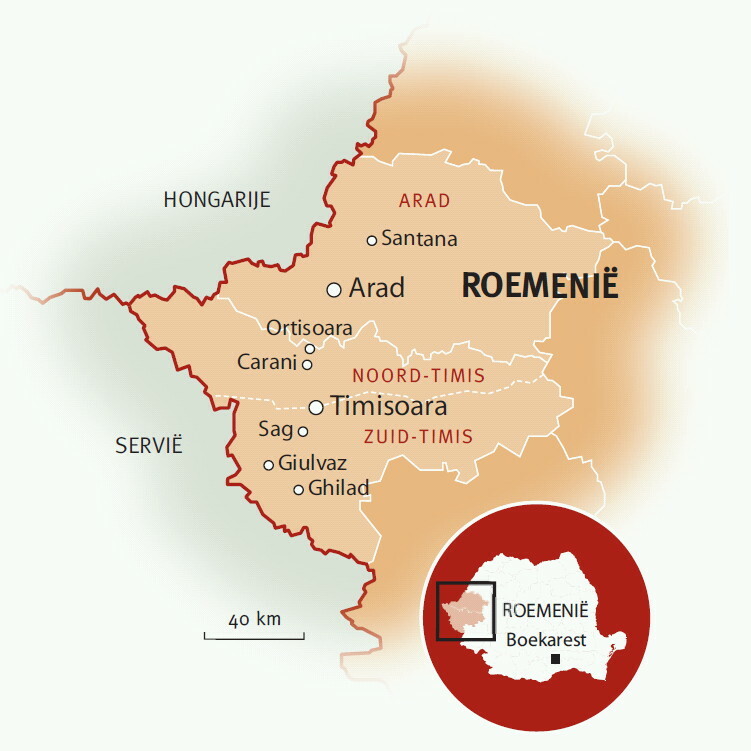 Now they own the main trading routes in West Romania as well, Europe’s granary that produces an average of 1.5 million tons of grain each year. Ever since, their trucks are going back and forth down the village road of Ortisoara – recently broadened to the bigger traffic axis where we spoke to their unsatisfied truck drivers. El Khalil committed fraud and tax evasion himself in 2011. The DIICOT estimates the worth at 30 million euro and called El Khalil ‘a member of an organised crime group’. Between 2008 and 2013, this group – in Romania better known as the Lebanese grain mafia – received 7.3 million euro in farm subsidies from the EU. Romanian farmers are mass-producing grains because the market demands these crops for exports. That makes them vulnerable: prices are being determined at the Paris stock market. ‘Foreign companies buy and export the crops harvested on Romanian land. Then Romania imports finished food products from other companies. Isn’t that crazy?’, says young Romanian farmer Vlad Rosca next to his Christmas tree full of cow-themed Christmas ornaments. ‘That is why we have decided to not only sell the crops to foreign companies, but also to make finished products ourselves. With European support for young farmers we are building a modern cattle ranch. We asked other Romanian cattle farm to join in. The idea: let’s start a cooperative and market our own dairy products! Two weeks ago we started production. Even Romanians are growing, you know. But slowly.’ Agro Vlad is an example of a relatively successful Romanian farm. And of a son who took over his father’s farm. With European support for young farmers, Vlad Rosca could produce and market finished goods himself instead of only producing and selling market crops to foreign trading companies. The Rosca family has understood that autonomy and independence from the foreign companies is key to survival. Now they have their own capital to invest in machinery and technology. Only the fast increasing land prices are posing a problem. ‘It wouldn’t be bad if the Romanian government would implement some restrictions for foreigners’, says Rosca. Also the report of the European Parliament recommends ‘legitimate restrictions of the free movement of capital’. ‘Transnational holdings concentrate agricultural lands, the vitality of the rural sector is weakening, the European model of family farming is eroding and young farmers are blocked from entering into agriculture.’ A recent study by the Transnational Institute, commissioned by the European Parliament, is sounding the alarm bell on landgrabbing in the EU. Culprit: a combination of free movement of capital, relatively low land prices in Central-Europe, corruption during privatization of former communist state-owned farms and European farm subsidies. A lot of companies own little land: 84% of the farms in the EU are based on families. In Romania this is still a solid 99%. But they own little land and half of them do not even qualify for subsidies. Few companies own a lot of land: 3% of the agricultural companies in the EU is in possession of half of the land and receive 70% of the subsidies (2010). In Romania, the most unequal EU-country, that is 0.4%. One third of the processed land is already in the hands of foreign investors. If alternative jobs are not created soon, this could lead to an increase in unemployment and emigration. The report suggests that poverty hits the deepest where land concentration is the biggest. Florentin is a small landowner who rents out land to the bankrupt Aton Group. To make things worse, the other company to which he rents out land has faced financial difficulties as well: the German Kampo Nova, active in Romania since 2009, made a loss of 1.2 million euro in 2016. On a mountain in the neighbourhood of Santana, in the adjacent northern district of Arad, we can see the field were Hungarian revolutionaries lost the war of independence against the Austrian Empire 170 years ago. Today a different battle takes place on this patchwork of vast plots and small, long strips of land. Modern tractors with German license plates are fertilising the land. At the entry of the company where they pick up the natural fertiliser we can see a sign that says: ‘We buy and rent land.’ On another sign is written that the company, Agro Sanktana, had been able to build silos in 2015 with 808.795 euro they received from the European Agricultural Fund for Rural Development. Agro Sanktana is one of the companies of the influential peasant family Grossmann from the Bavarian village of Vierkirchen. With a chunk of their capital earned in the Bavarian agriculture and real estate sector, they established their first farm in Romania in 2004. Peter Grossmann became managing director, his son Georg and former mayor Anton Schweiger shareholders. The first ten years they primarily borrowed money to buy land to be able to claim farm subsidies. They bought a former state-owned farm. Shareholders allowed them to rent three hundred hectares from locals annually. For the purchase of land and machinery they had annually 300.000 euro. Peter and Georg invested as well in Czech agriculture and real estate companies. Tar Farming was established with funds from investment company Tar Invest. In 2009 Tar Invest founded a new company in Santana, New Holstein Farming, that sold shares to Globinvest one year later. Globinvest is a company from Dubai, registered in Ras al-Khaimah, an emirate that prides itself on applying zero corporate taxes. Three years later Horn Gernot became managing director of all affiliate companies. Gernot had earlier already been managing director of Baltic Agrar, another farm from Schleswig-Holstein that is processing thousands of hectares at the Baltic Sea in Northern Germany and the North of Poland. When the mutual speculation caused too big of an increase in land prices in Santana, Tar Farming moved to a nearby village. There they bought an old communist workshop for agricultural machines. Nowadays they are processing 8000 hectares. The land they had already bought in Santana, they rent out to Denis. Simeon Budiu (pictured here is his colleague) has no European support for younger farmers and no heirs who want to take over the farm. He received an offer from a German investor. Grossman has already outgrown the old communist state farm he bought in 2009. In 2016 he made a profit of one million euro. The family farm of Denis, founded in the same year as Grossmann, has been working with the same infrastructure up until today. Their profit amounted to 55.000 euro. Maybe that was the reason why the road worker grinned and hesitated when we asked him if he knew people who had sold land to Grossman. In 2015 Grossman made the biggest land deal of the year: thirty hectares for more than a million euro. Denis knows that Grossman also had his eye on the thousand hectares of the Romanian farm Agromec. ‘Why should I sell? Land is the last thing we own. If we lose that, we become slaves’, says a bitter Simeon Budiu, owner of Agromec. But Budiu has no heirs that can take over the farm. One day his children will sell the farm, to be able to build a house or to buy a car. Higher subsidies, more credit and lower interest rates could tempt Romanian youth into taking over the farms from their parents, instead of emigrating. But it is German companies and investment funds that convert small patches of land into competing companies. And Romanians emigrating to Germany. There are 554.182 Romanians in Germany and each year this amount increases by 120.000. They are the fasted growing group of EU-citizens in Germany. Former Romanian farmers are working on Grossmann’s brand new industrial location. ‘My parents have rented their land to Grossmann’, says one of them. He is now processing the land as a worker on payroll. 266 family farms of 15 hectares, the European average, could easily fit on the 4000 hectares. That’s 266 families. But the German company currently employs only 12 people.